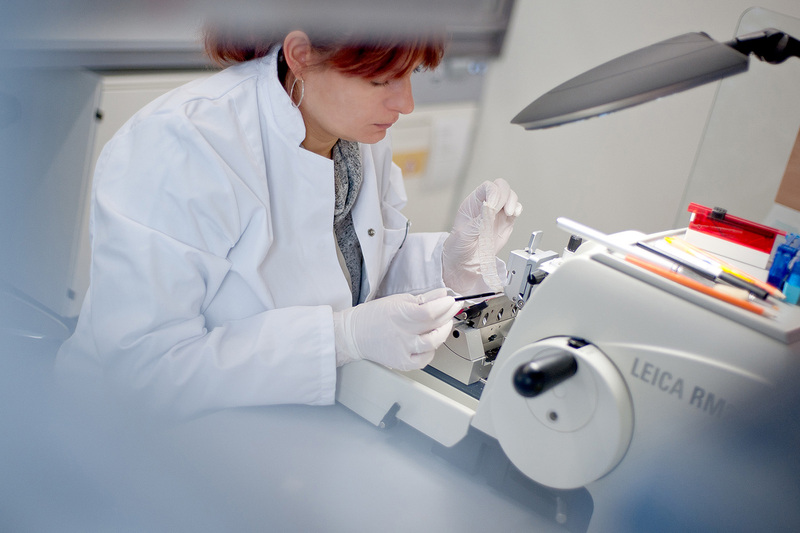 Biobanks of the German Biobank Alliance (GBA) have conducted a ring trial to review their individual measurement procedures for tissue biobanking, improve their processes and harmonise these within GBA in the long term. A ring trial involves processing biosamples from an identical source material, then sending these to a reference laboratory for review. GBA biobanks intend to conduct regular ring trials in the future, also using liquid samples. The biobanks used pig liver samples for the ring trial, which were sent to them by staff of the BioMaterialBank Heidelberg (BMBH). Upon receipt, the tissue was processed in the biobanks according to their standard operating procedure (SOP). Staff isolated RNA and DNA after predefined storage periods of different lengths and determined the nucleic acid integrity and concentration of extractions. They also prepared haematoxylin and eosin (H&E) tissue sections. The unstained tissue sections and extracted nucleic acids were sent to an independent reference laboratory for analysis (Integrated Biobank of Luxembourg, IBBL). The H&E sections were returned to the BMBH where they were examined by the Institute of Pathology and evaluated in terms of the section staining and slicing quality in addition to their compliance with predefined parameters. Members of the QM core team at the German Biobank Node (GBN) informed of the outcomes of this first GBA ring trial during personal feedback sessions, allowing the biobanks to obtain a detailed assessment along with suggestions to improve their work processes. Comparisons between the biobanks and further ring trials will enable the identification of conditions and elements of pre-analytics that have a decisive impact on sample quality. In this way, GBN and GBA contribute to safeguarding and continuously improving the quality of biosamples for use in biomedical research projects. The detailed results of GBA ring trials are to be published.